BACKGROUND AND PURPOSE: Contrast enhancement on MR images of patients with multiple sclerosis (MS) is known to be associated with abnormalities of the blood-brain barrier (BBB). However, little is known about diagnostic patterns and common features of enhanced MS lesions. This study was designed to evaluate initial enhancement patterns, changes in these enhancing patterns, and duration of enhancement in a cohort of patients with MS.
METHODS: Twenty-five patients with clinically definite MS were studied retrospectively. The appearance of enhancing lesions and sequential changes in the appearance on axial contrast-enhanced spin-echo images were evaluated. The enhancing lesions were classified as nodular, ringlike, or “other” (eg, arclike). RESULTS: Of 301 new enhancing lesions, 205 (68%) showed nodular enhancement, 70 (23%) a ring pattern, and 26 (9%) a pattern neither nodular nor ringlike (eg, arclike). Two hundred eighty (93%) of 301 enhancing lesions disappeared within 6 months, and seven (2%) lesions showed persistent enhancement longer than 6 months. The other 14 (5%) lesions, which disappeared by the time of the next scan, were excluded, because the course between two examinations was longer than 6 months. Of nine persisting nodular enhancing lesions on the follow-up images, seven were decreased in size, whereas all of two persisting ringlike enhancing lesions on the follow-up images were larger than before. CONCLUSION: Nodular enhancement is the predominant enhancement pattern for new MS lesions, and the temporal course of enhancement is usually shorter than 6 months. The appreciation of the evolution of MS-enhanced lesions aids in both identifying new MS lesions and distinguishing these lesions from other pathologic entities. This may be helpful in clinically evaluating the stage of MS lesions. MR imaging is the most sensitive technique for detecting multiple sclerosis (MS) lesions in vivo throughout the CNS. It has an established role in diagnosis and has also been used to investigate the natural course of the disease (1–3). Contrast-enhanced MR imaging is sensitive in detecting abnormalities of the blood-brain barrier (BBB) (4). Several authors have suggested that contrast-enhanced MR imaging is very sensitive to the acute inflammatory phase of MS lesion development and detects disease activity five to 10 times more frequently than does clinical evaluation of relapses (5, 6) or T2-weighted MR imaging (1, 7). Serial contrast-enhanced MR imaging studies have provided researchers with a better understanding of the natural history of MS and insight into treatment trials. Previous studies have reported sizes and numbers of enhancing lesions (8, 9). 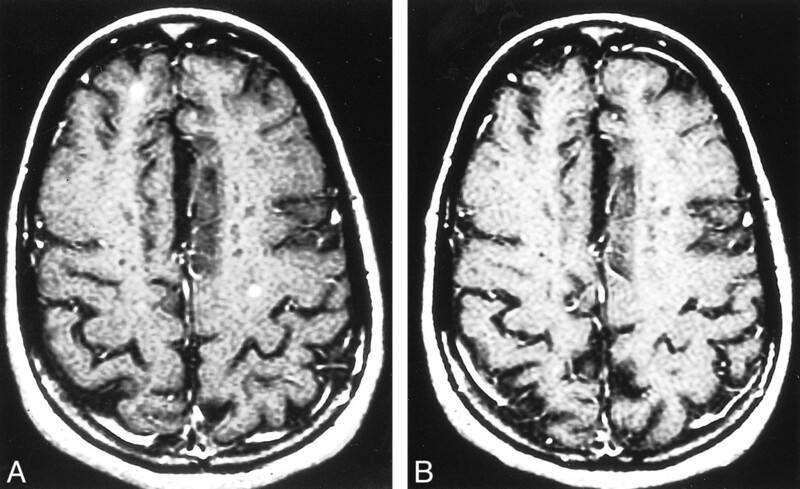 This study focuses on the longitudinal morphology of new MS lesions. Specifically, we evaluate 1) initial enhancement patterns of MS lesions, 2) changes in enhancement patterns, and 3) duration of enhancement. From the patients with clinically definite MS in our long-term National Institutes of Health–funded MS study, we studied 25 patients (five men and 20 women; ages, 28 to 66 years) who had at least one definite enhanced MS lesion during the follow-up period. All patients satisfied the Poser diagnostic criteria for MS (10) and had not been treated. Eighteen patients had a relapsing-remitting course, and seven had a secondary progressive course. Informed consent for MR imaging was obtained from all subjects. MR imaging of the brain was performed on a 1.5-T magnet by use of a head coil. The following pulse sequences were included: axial fast spin-echo (2500/16,80/1 [TR/TE/excitations], 3-mm-thick contiguous sections, 256 × 192 matrix,22-cm field of view); axial contrast-enhanced spin-echo images (600/27/1, 3-mm-thick contiguous sections, 256 × 192 matrix, 22-cm field of view). All patients underwent unenhanced T1-weighted scanning with the same acquisition parameters as the contrast-enhanced T1-weighted scanning. At least three MR scans were obtained from each patient during the observation period. We followed up at least twice when we found one enhanced lesion. The time between two MR examinations was 2 to 12 months; this interval was 6 months in 90% of examinations. The presence and appearance of enhancing lesions on T1-weighted postcontrast images were identified directly from the computer screen. For the purpose of this report, the precontrast T1-weighted and T2-weighted images were used only to help confirm the presence of an enhancing lesion. New enhancing lesions were defined as lesions that did not appear on a previous contrast-enhanced examination. The enhancing lesions were divided into three groups: nodular, ringlike, and other (eg, arclike). Sequential changes in the appearance of lesions were also monitored. One hundred forty-one contrast-enhanced MR scans were obtained from 25 patients. Most enhancing lesions were easily recognized as areas of increased signal intensity in the white matter on T1-weighted images. Questionable, small areas of enhancement near the cortical surface were excluded from the analysis. Excluding lesions that enhanced on the first and last scan and for which the total duration of enhancement could not be calculated, 301 new enhancing lesions were identified. Two hundred eighty (93%) of 301 enhancing lesions disappeared within 6 months; seven (2%) lesions persisted in enhancing longer than 6 months. The other 14 (5%) lesions, which disappeared by the time of the next scanning period, were excluded because the course between two examinations was longer than 6 months. Among the 301 new enhancing lesions, 205 lesions (68%) showed nodular enhancement, 70 (23%) showed ringlike enhancement, and 26 (9%) revealed other patterns, such as arcs or one small point in the center of the ring (Table 1). Of the 205 nodular, enhancing lesions, one was observed increasing in size on 2.5-month follow-up images, seven were decreased on 2.5- to 7-month follow-up images, and one lesion converted to a ringlike lesion after 6 months (Fig 1). Of 70 ringlike, enhancing lesions, only two lesions enlarged after 6 and 6.5 months, respectively (Table 2). All others (196 nodular, 68 ringlike, and 26 “other”) disappeared by the time of the next examination (Fig 2). MS lesions are known to be heterogeneous in nature (11). The natural history of MS lesions in the brain, based primarily on MR imaging and neuropathologic studies, is now understood to include evolution from an acute inflammatory lesion to a relatively stable, smaller lesion with variable amounts of tissue damage (12). Neuropathologic correlation studies have established that MR enhancement corresponds to areas of transient impairment of BBB associated with inflammatory infiltration (13). Enhancing lesions are increasingly important outcome measures in natural history studies, as they provide a direct, quantitative assessment of identifying active disease and distinguish new versus old lesions by identifying areas of BBB breakdown. Longitudinal MR studies reveal that subsequent to the first appearance of acute, enhancing MS lesions in the brain, these lesions undergo a series of characteristic changes over periods of days to months (12). To our knowledge, this present report represents the largest historical study of enhanced MS lesions, and provides a basis for understanding the natural history of enhancement in MS lesions. Guttmann et al (14) conducted a serial study of five patients with relapsing-remitting MS in the course of 1 year, and indicated that the majority of the new enhancing lesions were of the nodular pattern. In the course of their evolution, the general trend was one of transition from an earlier nodular to a predominantly ringlike pattern. The ringlike, enhanced pattern was significantly more frequent at time points longer than 29 days after initial imaging. In our study, we followed up 301 enhanced MS lesions from 25 MS patients. The vast majority of new enhancing lesions showed nodular enhancement (68%), 23% showed ringlike enhancement, and 9% demonstrated other patterns, such as arcs. For the ringlike, enhanced lesions (23%), we cannot confirm whether these lesions had changed from an initial nodular pattern. In the majority of our cases, the previous scan had been obtained 6 months earlier, exceeding the 29-day time points cited by Guttmann et al (14). Among the persistent enhancing lesions, however, we observed the conversion from nodular to ringlike pattern, but not from ringlike to nodular pattern, suggesting that the initial enhancing pattern was nodular. The enhancement pattern is likely related to the histologic age of the MS plaque. Histologically, MS plaque types can be divided into acute, chronic-active, chronic-inactive, and “shadow” plaques (14). Edema, myelin swelling, macrophage infiltration, lymphocyte infiltration, and endothelial cell activation are evident in acute plaques. Although chronic-active plaques are histologically older than acute ones, myelin breakdown is still ongoing, with foamy macrophages actively removing and digesting myelin. The chronic-active plaque margin is broad and markedly hypercellular, owing to parenchymal infiltrates, oligodendroglial hyperplasia, hypertrophic astrocytes, and abundant macrophages. The center of the plaque can be identical to that of the chronic silent plaque (15–16). Ringlike enhancement probably arises from recent inflammation at the periphery of a chronic-active lesion in which the BBB defect has been partly or completely repaired centrally (17). It is noted that occasionally the ongoing activity affects one margin of a plaque and the remainder is quiescent, which may be a cause of the formation of the arc pattern. From the evolution of the persistent enhancing lesions detected in this study, we found that nodular enhancement tended to change from a larger to a smaller size (ie, in seven of nine), except for one that increased in size and one that converted to a ringlike lesion. In contrast, all lesions of ringlike enhancement (two of two) converted from smaller to larger rings. Publications (11, 18, 19) concerning the correlation between enhancement pattern and magnetization transfer ratio (MTR) suggest the nodular enhancing lesions have the highest MTR. This could be the result of early inflammatory response, leading, in most cases, to isointense lesions, probably without significant matrix destruction. Conversely, the central portion of the ringlike, enhancing lesions had the lowest MTR, possibly reflecting a high degree of matrix destruction. Rovira et al (19) found that more than half of ringlike, enhancing lesions change to areas of hypointense nonenhancement on T1-weighted images, and these hypointense lesions have been thought to represent chronic plaques with severe demyelination or axonal loss (19). In addition, changes in size of the ringlike, enhancing lesions in our patients support the belief that demyelination occurs from the center outward (11, 20, 21). A serial MR study (22) of 8 to 11 months' duration in six patients with relapsing-remitting MS showed that 95% of new enhancing lesions reveal persistent contrast enhancement in a period shorter than 8 weeks. No lesions consistently enhanced for more than 16 weeks. Our results confirm and extend these findings. The vast majority of lesions (90%) enhance for no more than 6 months, most under 6 months, suggesting that the abnormality of the BBB is a transient phenomenon. Over a short period, visually conspicuous contrast enhancement decreases, eventually completely. This seems to correspond to restoration of the integrity of the BBB (12). However, we saw seven (2%) lesions that continued to enhance longer than 6 months, with two ringlike enhancements and five nodular enhancements. An immunohistochemical study showed evidence of perivascular fibrinogen, IgM, and other serum proteins, suggesting an increase in vascular permeability in some old lesions (23). Additional evidence (24), such as perivascular collagen deposits and degenerative changes in astrocytic swelling as indicators of increased BBB permeability, also suggested that CNS endothelial cells showed persistent abnormalities of the BBB, even in the absence of active inflammation. Our data, together with previous MR evidence (25–27), indicate that, occasionally, BBB abnormalities may persist for a longer time, even in secondary progressive MS (28). This phenomenon may be either an epiphenomenon or associated in a minor way with pathophysiology. Contrast-enhanced MR imaging appears to be a sensitive method for detecting active MS lesions. But lesion activity should not be equated with enhancement; more activity is taking place than just that defined by enhancement. The BBB abnormality is transient; it becomes less important over time. It is unlikely that all the inflammatory changes only occur in this temporary period of enhancement. Inflammatory changes in MS are not always detected by enhancement, particularly when the level of inflammation is low. Nesbit et al (29) suggested that the breakdown of the BBB in MS might be related to macrophage migration and infiltration, but the association is weaker with perivascular lymphocyte infiltration. Some evidence of inflammatory activity is a common finding, albeit at a low grade and affecting a few vessels only, even in silent-appearing MS lesions. Such activity comprises a few small lymphocytes, numerous plasma cells, large mononuclear cells, and the occasional mast cell. 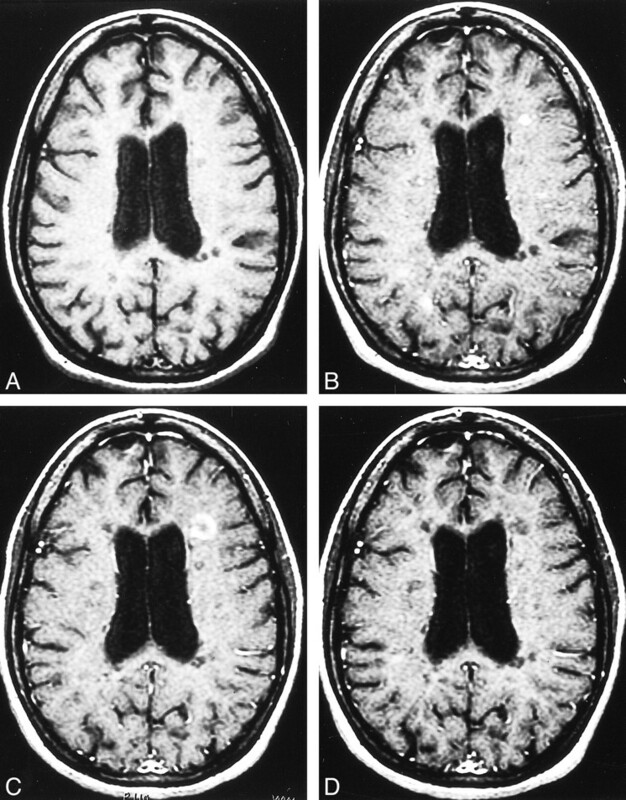 Furthermore, for the secondary progressive and primary progressive stages, and for the abnormalities in normal-appearing white matter with MS, decreasing levels of enhancement and/or little enhancement are observed in spite of increasing neurologic deficits, also suggesting a diminished role of the BBB abnormality indicated by contrast enhancement (1). In addition, enhancement depends on many other factors (1), including the time from injection to imaging, the dosage of contrast agent, the magnitude of BBB abnormalities, the volume of accumulation space, and the exact MR pulse sequence. Filippi et al (30) had reported that a triple dose of gadolinium (0.3 mmol/kg) or a single dose (0.1 mmol/kg) in combination with a magnetization transfer pulse could increase the number of detectable lesions in relapsing-remitting and secondary progressive disease. They also suggested that the pathologic process is less severe in MS lesions enhancing only after triple-dose injection than in those enhancing after single-dose injection (31). Triple-dose contrast-enhanced MR imaging may detect subtle BBB damage (32). Although it has been reported that contrast-enhanced examination is helpful for detecting a treatment effect in MS patients over shorter periods of time, enhancement may not be a good measurement of how effective a drug is. The effect of drugs should be monitored over a longer time course, and drugs can act at other levels besides BBB. The enhancement of MS lesions on T1-weighted images may be in the form of nodules, rings, or other patterns. Nodular enhancement is the predominant pattern for new MS lesions, whereas ringlike enhancement appears to be a secondary pattern. The course of enhancement is transient and usually is shorter than 6 months; rarely it may persist for a longer time. The appreciation of the evolution of MS-enhanced lesions aids in both identifying new MS lesions and distinguishing these lesions from other pathologic entities. This may be helpful in clinically evaluating the stage of MS lesions. ↵1 Address reprints requests to Robert I. Grossman. 2 Supported in part by grant NS29029 from NIH. Patient 14. Secondary progressive MS. Axial contrast-enhanced T1-weighted MR image (600/27/1 [TR/TE/excitation]). A, No enhanced lesion can be seen on image 6 months prior to follow-up. B, A new, nodular, enhanced MS lesion appears 6 months later. C, After 6 months, the pattern of nodular enhancement converts to a ringlike pattern. D, After another 6 months, the ringlike, enhanced lesion cannot be seen. Patient 17. Relapsing-remitting MS. Axial contrast-enhanced T1-weighted MR image (600/27/1). A, Two new nodular, enhanced MS lesions. B, After 4.5 months, the nodular, enhanced lesions disappear.